One of the nicest manufactured homes I've seen in a while. Triple-wide with lots of upgrades; looks like a custom home inside and the grounds are manicured including a wonderful fruit and vegetable garden. Features 3 bed, 2 bath, approx. 2250. sq.ft. built in 1997. Vaulted ceilings add to the expansive feel; the kitchen has granite tile counters, a large island, travertine backsplash, decorative ceiling, skylight and all appliances included. The woodstove with a slate hearth warms the home, beautiful hardwood flooring, the master has high ceilings, a walk in closet, granite tile counters and a luxurious soaking tub in the master bath. 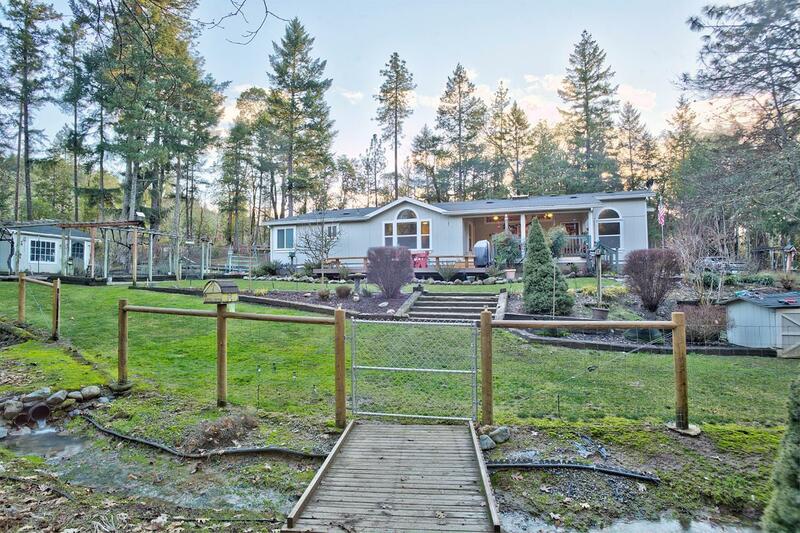 The home is on a block foundation, has an attached 2 car garage, a garden shed, fruit trees, water feature...all this on 5.1 acres with a strong 16 gpm well per owner. Privately set off the road. Directions: From Merlin, drive west on Galice road. Turn right on Hugo road. Address is on the right.